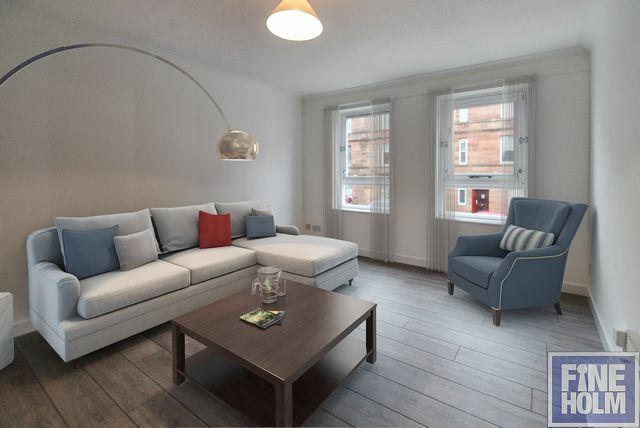 Gorgeous , fresh and bright 2 bedroom first floor flat which has been full refurbished throughout and offers a cosy, convenient and stylish flat to call home! The property is located on the first floor of a residential block located in Cathcart/Battefield/Mount Florida area - moments from Langside campus of GCC and New Victoria Hospital. It has entrance hallway, leading through to bright living room and off that is the newly fitted kitchen with grey gloss units and appliances supplied. There is an attractive bathroom with shower over bath and master bedroom with generous fitted wardrobes along the back wall. Further second bedroom to the rear. The decor throughout is contemporary with wallpapered walls and grey toned laminate throughout. Electric heating. Secure entry. Residents parking.